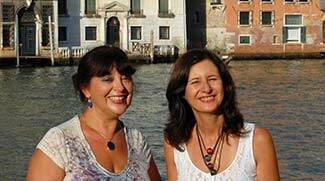 ABOVE: Roberta Curiel and Sara Cossiga offer walking tours of Venice in four languages. Venice is a city that's best explored on foot. If you have a good map, plenty of time, and feet that don't tire easily, you can easily explore the city on your own. But if you're a typical foreign visitor who spends only two or three days in Venice, a professional guide can help you make the most of your stay. The challenge, of course, is to find a licensed tourist guide who speaks fluent English and offers itineraries for individual travelers or small groups. Roberta Curiel and Sara Cossiga have come to the rescue with Walks Inside Venice, which they and a former colleague founded in 2001 after more than a decade as licensed guides in Venice. Walks Inside Venice offers more than 20 itineraries under the headings of "Art & History," "Discoveries," "Venetian Lifestyles," and "Specials" (the latter including such topics as a photographic tour and Murano Glass). Most of the walking tours last three hours, although you can request an extra hour or two when booking if you've got strong feet and a long attention span. One itinerary, "Exploring the Lagoon," runs six hours, including boat travel to the islands of Murano, Burano, and Torcello. And for those travelers who'd like to imbibe more than culture, the "Cicheti & Nizioleti" tour offers a chance to sample vino and viands at traditional bacari or wine bars. Photo courtesy of Walks Inside Venice.